Some of the most stunning architectural structures in India are to be found below ground: these are its ancient stepwells. Stepwells are unique to India; the earliest rudimentary wells date from around the 4th century CE, and eventually they were built throughout the country, particularly in the arid western regions. Stepwell construction evolved so that, by the 11th century, they were amazingly complex feats of architecture and engineering, not only providing water all year long but also serving as meeting and gathering places, refuges and retreats. 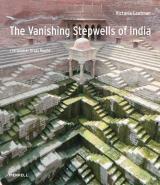 The journalist Victoria Lautman first encountered stepwells three decades ago, and now, a seasoned traveller to India, she has devoted several years to documenting these fascinating but largely unknown structures before they disappear. Of the thousands of stepwells that proliferated across India, most were abandoned as a result of modernization and the depletion of water tables. Frequently commissioned by royal or wealthy patrons, the wells vary greatly in scale and design. Some also functioned as subterranean Hindu temples, featuring columned pavilions and elaborate stone carvings. Islamic wells were generally less flamboyant, but often incorporated large chambers. Although relatively few stepwells are in use today, the Indian government and heritage organizations are recognizing the need to preserve these architectural wonders. While many wells are still rather decrepit, their magnificent engineering and great beauty never fail to impress.